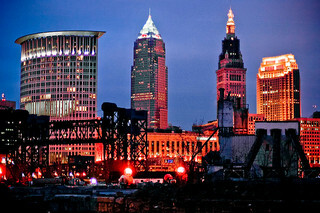 Cleveland has been chosen as a global finalist in the World Wildlife Fund (WWF) “We Love Cities” campaign. Cleveland, our green city on its blue lake, is one of only three US cities ranked among the world’s leaders as an environment where humans and nature can exist in productive harmony. Mayor Frank Jackson’s annual sustainability summit, held every year since 2009. Cleveland’s Neighborhood Climate Action Toolkit, helping neighborhoods and residents take actions to advance their neighborhood goals, while also furthering Cleveland’s climate action goals. LEEDCo’s offshore wind project in the Great Lakes, the first offshore freshwater wind project in North America. And, of course, our celebration of 2013 as the year of Advanced & Renewable Energy. To see even more reasons, scroll down to the photographs on the WWF “We Love Cleveland” page. Cleveland is one of 34 cities, from 14 countries, that the WWF selected as a global celebration of the world’s most lovable sustainable cities. WWF looked at smarter transportation, cleaner energy, efficient buildings, and less waste, and recognized that Cleveland is a leader. We’re up against some heavy hitters, places like North Vancouver, British Columbia … Copenhagen, Denmark … Brussels and Antwerp, Belgium … Rio De Janeiro and São Paulo, Brazil … Cape Town, South Africa … not to mention Chicago and Boulder, Colorado. Impressive company, indeed. So Cleveland can use every vote we can give it. And you can give Cleveland your vote every day — every day — from now until March 24. The winning city — the world’s most loveable sustainable city — will be announced March 27. Cast your vote here (scroll down to the VOTE button) to help Cleveland claim the title of the world’s most loveable sustainable city. You can vote once per day, so set your favorite reminder, and please share this information with everyone in your network. Every vote counts! Cleveland has a lot to be proud of, and your votes will help our town get the recognition it deserves. Vote today: tell the world just how lovable Cleveland is! Saturday, Jan. 11, 9 am–2 p.m.
Sunday, Jan 12, 10 a.m.–1 p.m. 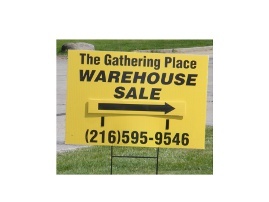 The sale takes place at The Gathering Place Warehouse, 4911 Commerce Parkway in Warrensville Heights (map). Shop recycled at The Gathering Place Warehouse Home Furnishings Clearance Sale: save money, bring beautiful things into your home and keep fine furnishings and personal accessories out of the landfill. Want to stay in touch with the latest in recycling news in the Cleveland area? Just click on the Subscribe link below any of my article headlines or following the bio on my Examiner.com page. To access more of my articles on recycling in northeast Ohio, click on my name or visit my blog, Keep It Out of the Landfill.